All things physics! Vodcasts for physics lectures and homework review. PHYSICS: So why do instruments that are playing the same note sound so different? Here’s our discussion of harmonics and beats. PHYSICS: Great music today! And great discussion of intensity and resonance! Were you okay with the problems? Couple of items to apply for further contemplation – so how does the whole hearing thing work? I mean, I know the little bones in your ear move, but why? Is resonance involved? Great item for application/discussion! PHYSICS: So you can see sound?! Here’s the lecture from today – some wave stuff, echolocation, speed of sound, …. Too much fun!! PHYSICS: Cool thing, standing waves! How’d you like making waves with slinkies? Are you okay with constructive and destructive interference? 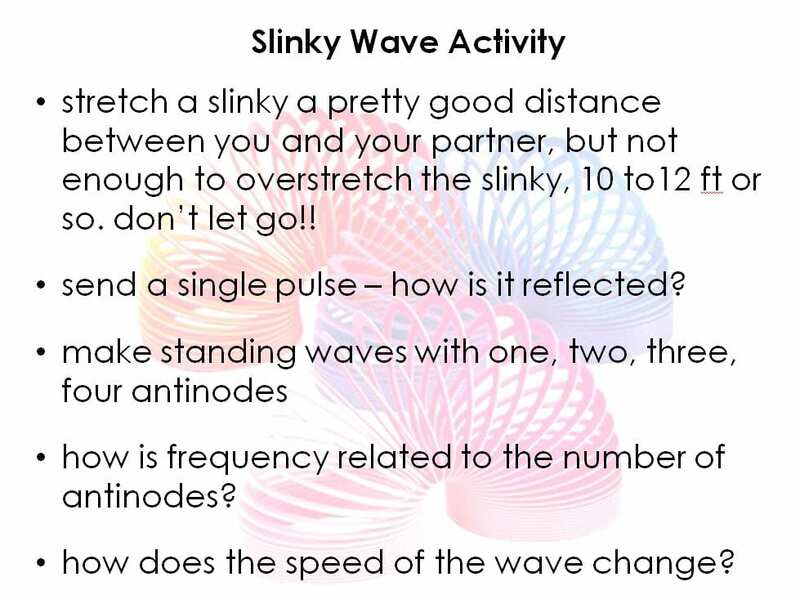 Here’s the slinky activity for today. Stretch the slinky a pretty good length between you and your partner, but not enough to overstretch the slinky. Below that, the discussion of wave interactions. Physics 3-22-16 Wave Interactions from Tammy Skinner on Vimeo. PHYSICS: Hey guys! Here’s our discussion on the properties of waves. Remember anything from your earlier 8th grade physical science days? Problems are pretty simple for you, I think. Do you remember the main formula from chemistry? Speed = wavelength x frequency (c = λf). Easy peasy – and don’t forget the applications! PHYSICS: Springs and pendulums, back and forth… back and forth. Here’s the lecture from today on simple harmonic motion. PHYSICS: Were you amazed at the effect of change in surface area on the velocity of water, and especially the pressure of water, flowing through a tube? Thaaaaat explains how a calm ride on a lazy river can turn crazy in just a few seconds! Today we concentrated on quantitative applications of Bernoulli’s Principle and a few practical applications. Tomorrow we’ll take a look at the problems and a couple more cool ways to apply Bernoulli! !